The Chop Magic makes all your kitchen cutting needs a breeze. It can quickly chop, mince, cube, slice and dice in just seconds with little effort. This amazing chopper saves you a ton of time when compared to cutting the old fashioned way, which is tough and takes forever. Just use the Chop Magic and you can get the job done in just seconds. This is because the Chop Magic can cut everything in a just single pass. Plus the combination of 12 ultra-sharp stainless steel precision blades also provides uniform results every time. Using the Chop Magic is as easy as selecting your ingredients, choosing a blade, and then pushing down. All the chopped food is neatly stored into the collection container underneath so there’s no messes. You can use the Chop Magic to cut meats, vegetables, fruits, cheeses, and more. It easily chops an entire onion in just a few seconds without having to worry about any odors or tears. Plus clean up is simple too since the Chop Magic is dishwasher safe. When not in use, the light and compact design lets you easily store it in a cupboard or drawer. 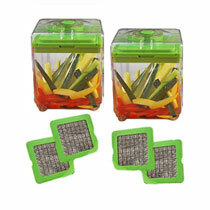 The Chop Magic Chopper includes a set of 2 blades with one for mincing and one for dicing. It sells for $19.95 plus shipping and handling. Currently there’s a buy 1 get 1 free offer where you’ll receive a second Chop Magic set for free if you pay the extra shipping and handling cost for it. Plus each order also includes a set of free bonuses. You’ll get a set of 2 Perfect Tortilla Pans, 2 Recipe Guides, and a bonus online only mystery gift.